Myanmar City Star Travel & Tours Co. Ltd, formerly known as Tai Star Travels, is an authorised, private, independent inbound tour operator and destination management company that provides travel services in Myanmar since 2001. Whilst providing a wide range of bespoke and tailor made travel services across Myanmar, we specialise in leisurely adventure travel to highly specialised expeditions in the Myanmar Himalayas and Myanmar border crossings with or without client’s own vehicles. We are dedicated to sustainable tourism promoting the businesses, involvement and employment of local communities in travel and related industries at all our destinations within Myanmar. We are member of UMTA and PATA NY Chapter. Below are just some of the special tailor made journeys we outfitted and the stories of these trips shared by our clients via different media platforms. An ultimate alpine climbing (anti-Everest Expedition) to Hkakabo Razi (the highest peak in Myanmar and South East Asia) for The National Geographic and The North Face explorers. Read the additional news on the expeditions here. See the expedition teams live dispatches from the front line on The National Geographic official blog and The North Face official blogs. The story on this expedition was being featured in 2015 September issue of The National Geographic Magazine. The documentary video about the expedition is expected to be released in Autumn 2016. See all the preview and short documentary video released by The National Geographic and The North Face. New Rhododendron species discovered from Phungun Razi and MaDoi Razi Explorations in Myanmar Himalayas (link to this article). Bent, one of our clients, launched 3 expeditions to Phongan Razi and Maoi Razi in Myanmar Himalayas in Northern Myanmar (Burma) between 2009 and 2011. From these expeditions he has discovered more than 20 new species of Rhododendrons. 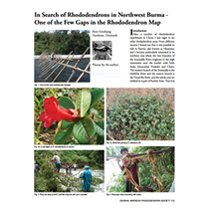 The stories on his expeditions were published in The Summer 2013 issue of The Journal of American Rhododendron Society. Madventure launched its first cross border travel through Myanmar on their London to Sydney overland tour route in September 2014. 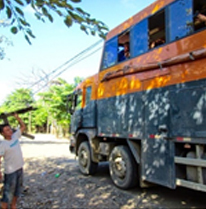 Read their overland journey through Myanmar on their official blog posts. We specialise in providing tailor made holidays and travel services that suit our client’s requirements. We outfitted a wide range of travel services from a cultural and leisurely holidays to complicated travel arrangements such as border crossings with client’s own vehicles and highly technical expeditions to Hkakabo Razi. We go extra miles to meet our clients requirements and success of their special trips. Our sample tours and itineraries can be adjusted to meet your requirements, such as departure dates, add-on tours and extensions, optional supplements, standard and types of the hotel/ accommodation, means of transports between sites, domestic flights, tour guides that speak English or other major languages. See details on our Tailor Made service page. We are a local operator with more than a decade of experience in outfitting various types of tours in Myanmar from straight forward leisure travel to complicated and unique tours for customers with different travel goals. We exercise a great attention to small details. We conduct our business with professionalism and personal touch. Our company is run by well travelled professionals with first hand knowledge and local insights who will speak from experience. We go extra miles to help you meet your travel goal with a personal touch. Our tours and services are great value for money with a focus on providing quality services. We use experience and knowledgeable guides, tour leaders and well train staff. We use private transport for transfers within cities, road travel between cities and to border ports. We use some of the best 3, 4 and 5 star accommodations depending on client’s requirements. We have very flexible approach in helping you plan your trip. All our customers have tour manager for their trip and back office personnel who will track the progress of the trip to ensure you have a pleasant journey and also provide a reliable support and back up anytime during your trip with us. Responsible tourism is at the core of our tour operations. As one of the local businesses ourselves, we feel strongly that our tours and services make a positive difference and benefit the local communities in all our Myanmar destinations. We give businesses and promote employment to local work force and other tourism related industries, for instant through using station guides in most cultural tours, trail leaders, mountain guides, cooks and porters in trekking tours, and local transport providers in each destinations. We ensure our guests are educated in appropriate etiquette and respecting local tradition, customs, religions and heritage. We also facilitate cultural exchange where possible so that both guests and local communities can learn from each other. We provide training to our staff. We also lobby for various issues which could benefit the whole industry from educating locals indigenous populations in north of Myanmar and involving them to be part of tourism industry to a better working conditions and a better regulated labour market in some remote area to ensure fairness goes both way for service providers and travellers. Responsible travel is at the very core of our business model. We are constantly looking for ways to help the local communities at all our destinations in Myanmar. We give businesses to the members of the local communities such as station tour guides, porters, cooks, local providers of various modes of transports (horse carts, rickshaw, vehicle hires, boats) and accommodations (from local village home stay, guesthouses to hotels). Where required, we choose operating partners with responsible tourism ethos and good corporate social responsibilities who employ the members of local communities in their operations. We also facilitate cultural exchange between our guests and local communities where possible and if it is of our guests’ interests, aiming for both sides to benefit in many ways. Many of our guests were able to spend time with local communities during their trips. This has enabled our guests to learn the way of life of local people in main tourist destinations as well as the indigenous communities in the remote frontiers and Myanmar Himalayas, their wishes and views on tourists visiting the area. We listen to both our local communities, guests and other stakeholders in our industry. This has enable us to constantly looking for ways to help local communities and to get them involved through tourism. We ensure that all the tours we operate encompasses the following. Since the Myanmar tourism was fully privatised in 1996 until the country was open up in 2011, tourism was one of very few industries that had been able to provide opportunities that provides local population with opportunities to create their own businesses, jobs and employments in openly competitive market. Since the country opened up in 2011, the whole industry has flourished even more with increasing numbers of local tour operating companies and as well as foreign individual and multinational operators. Local communities in general population of Myanmar are part of Myanmar Tourism Industry, as they work and operate businesses in tourism and related industries. It is inevitable that a proportion of holiday costs will go into government treasury through official fees and taxation. However responsible use of operators through your trips ensure your money goes to the main work force of the Myanmar ravel industry. Visitors to Myanmar has made a true difference to local workforce and micro economy they operate in. Tourism in Myanmar has allowed local people to experience the presence of international community and in many cases provide the cultural exchange opportunities with the visitors. Check our sample itineraries and send us your chosen travel plan, group size, level of accommodation, preferred modes of transports (flights, overland, river ways), travel dates and all other requirements for a quote. For group tours, we can reserve a place for your chosen tours and departure dates for 7 calendar days before you make a final decision. We can take care of your domestic flights within Myanmar, however we do not offer services on international flights. Customers are required to ensure that they have all required travel documents such as valid passports and visa as well as a sufficient travel insurance cover. In order to proceed with booking tours and travel services, clients are required to complete and sing our booking form and make a deposit (25% of the total costs and 50% of the total for sailing) or full costs if booking less than 4 weeks prior to departure date. Once we received the deposit or full payment, we will send you a booking confirmation and the invoice for the remainder balance which is due 5 weeks prior to your departure date. The remaining balance needs to be settled 5 weeks prior to your departure date or immediately if booking within less than 5 weeks from the departure date. Upon receiving the full amount for your trip, we will provide Service Confirmation of all travel services you have booked with us. We will also send you the general travel information and specific information depending on your itineraries. We may also need you to complete indemnity and liability release forms for some of the travel activities, e.g. travel to remote frontiers in Myanmar and outdoor activities. All our quotations and prices are in USD. We accept all major debit and credit cards via paypal, paypal payments and bank transfers. Card payments and paypal transfer incur a charge of 2% of the total costs. In case of payments by bank transfers, clients need to ensure that the net amount is transferred and all transfer charges their bank may apply are debited from their account. Click here to see our detailed Booking Terms and Conditions.